With children's saving accounts, children learn to manage money – and parents, relatives and friends have a place to save for a child they care about. Which children's savings account is best for your child? By saving just £5 a month for 18 years, your child could end up with enough for driving lessons or a deposit on their first rented flat. Having their own savings account makes children more money aware and can encourage them to develop good savings habits as grown-ups. Until your children are old enough to stash away some pocket money or birthday present cash themselves, you can save a little for them every month. Set up a standing order to build up a lump sum for them over a few years. Children's savings accounts are much the same as adult ones and are offered by banks and building societies. There are a few variations, but mostly they're simple, safe cash accounts that usually pay some interest. You can open a savings account with just £1 for any child aged up to 18. Children over seven can operate their savings account themselves – depending on the account, they can take money out and pay it in. There are also tax-efficient accounts called Junior ISAs – more about them later. Children born between 1 September 2002 and 2 January 2011 qualified for the government's Child Trust Fund scheme. There are two main types of children's savings accounts: easy or instant access and regular savings. As the name says – you or your child can withdraw or deposit money at any time. Typically you get a lower rate of interest than with other account types. These are designed to encourage regular saving – you have to save money in the account every month, and you might not be able to take it out easily. They usually pay a higher rate of interest than instant and easy access accounts. With most accounts, if you miss some monthly payments the interest rate might be reduced. Many banks and building societies offer freebies like toys or piggy banks, designed to tempt children, but their accounts often pay a low rate of interest. There's nothing stopping you opening more than one account – one with the best rate of interest, and the other so the child can get their free gift. Do children need to pay tax? Like adults, children have a Personal Allowance for Income Tax – £11,860 for the tax year 2018-19. As long as their annual income (including interest) is below this amount, they won't have to pay tax on it. To claim back any tax that shouldn't have been paid, you should complete Form R40 from HM Revenue & Custom. If you have given your child money that earns over £100 a year in interest, dividends, rent or any other investment income, the interest will be taxed as if it were yours. This doesn't apply to Junior ISAs, Child Trust Funds and Children's Bonds (previously known as Children's Bonus Bonds). This doesn't apply to anyone else – grandparents and friends can give as much as they like. However, there might be tax implications that you'll want to consider. Giving cash at the wrong time or in the wrong way could end up being chased by the tax man at a later date. Junior ISAs and Children's Bonds are another option for tax efficiency. Children can save up to £4,260 for the tax year 2018-19 in their Junior ISA, and none of the interest is taxed. They can only access the money when they're 18, and at that point, the money belongs to them. You can use comparison sites to get a comprehensive list of savings accounts, including children's accounts. An increase in the state pension rate is among a number of welfare reforms to come into effect throughout April 2018. The State Pension has also increased from 9 April, in line with the ‘triple lock'. The full basic State Pension was put up by 3% to £125.95 a week. This means that the government will have raised the full basic State Pension by £1,450 a year since 2010. The full rate of the new State Pension also increased by 3%, to £164.35 a week. Scam warning – Have you had a mail from HMRC? We've recently been made aware of someone receiving an email that looks like it has come from HM Revenue and Customs (HMRC). They appear to be sent from incometax@taxvol.org.uk. Tax Help for Older People/Tax Volunteers never send unsolicited emails. If you receive any unexpected emails that look like they've come from us, please get in touch. Either give us a call on one of the numbers shown at the top of every page of this website, or use the contact form. As soon as you have done this, delete the email. Do not reply to it and don't click any links in the email. Check HMRC’s guidance on recognising scams if you’re not sure. 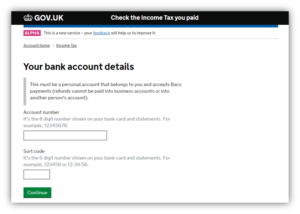 Forward suspicious emails to phishing@hmrc.gsi.gov.uk. HMRC offers many ways of dealing with tax through its website. The most important of which is the 'Personal Tax Account. It's a convenient way to manage tax credits and benefits and confirm details of your National Insurance number. New services are being added all the time. From today (Monday, 1 August 2016) you can use your Personal Tax Account to check your end of year PAYE tax position and see if you’ve paid too much or too little tax. 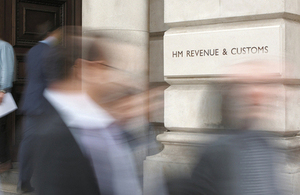 PAYE tax is based on the information that HMRC hold. If that information is out of date or incomplete, tax collected over the year may be wrong. Each year the tax man carries out an end of year reconciliation for everyone and then writes to anyone who has paid too much or too little tax. For the first time, if you've paid too much tax, you will be invited to fill out your bank details so that HMRC can pay back what they owe straight into your account. Of course, a Personal Tax Account won’t work for everyone. For those with slightly more complex situations, such as where you have nominated someone else to receive any repayment, or if you can’t get online, HMRC continue to offer their existing services. From Monday 1 August some of us may see a slight change to the end of year reconciliation letter (P800). If you'd like to see what it might look like, click here. As you can see it encourages us to use our Personal Tax Accounts. In the first two weeks of August, HMRC will test how this works with some of us who are due a tax rebate. Then, providing everything is working as it should, from 22 August, everyone who has paid too much tax will receive a letter inviting them to use their Personal Tax Account to get a rebate quicker. Later this the year HMRC will introduce an online payment service for people who haven’t paid enough tax through PAYE. HMRC has today announced the next step in its ten-year modernisation programme to create a tax authority fit for the future, committing to high-quality jobs and the creation of 13 new regional centres over the next five years, serving every nation and region in the UK. The modernisation programme, now at the halfway point, includes investment in new online services, data analytics, new compliance techniques, new skills and new ways of working, to make it easier for the honest majority of customers to pay their tax, including by improving customer service, and harder for the dishonest minority to cheat the system. The changes have already resulted in over 80% of people filing their Self Assessment returns online and given customers new, simple ways to check their payments, make changes or find answers to questions. The tax authority, which raised a record £517 billion for public services last year, will open its first new regional centre in 2016-17, with others following between 2017 and 2021. HMRC’s 58,000 full-time equivalent employees are currently spread across 170 offices around the country, many of which are a legacy of the 1960s and 1970s, which range in size from around 6,000 people to fewer than ten. HMRC will bring its employees together in 13 large, modern regional centres, equipped with the digital infrastructure and training facilities needed to build a more highly-skilled workforce to meet the challenges of bringing in more revenue from those evading tax and improving its customer service to the honest majority. The transformation supports the Government’s commitment to locate jobs throughout the country. Bringing staff together in large centres will enable people to develop careers up to senior levels, with less need to move around the country, and will support the growth of specialist teams and links with universities and other sources of skilled recruits. HMRC is committed to modern, regional centres serving every region and nation in the UK, with skilled and varied jobs and development opportunities, while also ensuring jobs are spread throughout the UK and not concentrated in the capital. HMRC has too many expensive, isolated and outdated offices. This makes it difficult for us to collaborate, modernise our ways of working, and make the changes we need to transform our service to customers and clamp down further on the minority who try to cheat the system. The new regional centres will bring our staff together in more modern and cost-effective buildings in areas with lower rents. They will also make a big contribution to the cities where they are based, providing high-quality, skilled jobs and supporting the Government’s commitment for a national recovery that benefits all parts of the UK. The changes will enable HMRC to give customers the modern services they now expect at a lower cost to the taxpayer, meeting the Government’s challenge for all departments to do more with less. HMRC expects the majority of staff to be able to move from their current offices to a regional centre, and is phasing the moves over ten years in order to minimise redundancies. But HMRC will aim to have fewer staff in the future as it streamlines how it works and uses the best of modern technology to reduce costs. This is a press release issued by HMRC, first published on their website. From 12 October 2015, a new scheme is being launched helping anyone reaching State Pension age before 6 April 2016 to safeguard their long-term financial security. Men aged 65 or older and women aged 63 or older are being offered a chance to increase their State Pension by up to £25 a week, giving them guaranteed extra income for life. The scheme will remain open for 18 months and those who think they can benefit will be able to buy additional State Pension – worth up to £1,300 a year. In most cases, surviving spouses and civil partners will be able to inherit at least 50% of the extra pension. This is an opportunity for people to increase their guaranteed retirement income for the years ahead with a boost which will be index-linked, helping to protect pensioners and their spouse or civil partner from inflation. This government’s commitment is to provide security for working people at every stage of their lives, and that includes giving people the chance to enjoy a financially secure retirement. We have already committed to protecting pensioner incomes with the triple lock – uprating the basic State Pension by at least 2.5% each year of this Parliament. The new State Pension, coming in from April 2016, will ensure a simpler, more sustainable State Pension for the pensioners of tomorrow. Top up is an opportunity for people already retired, or reaching State Pension age before April 2016, to boost their later life income. It won’t be right for everybody and it’s important to seek guidance or advice to check if it’s the right option for you. But it could be particularly attractive for those who haven’t had the chance to build significant amounts of State Pension, particularly many women and people who have been self-employed. With the scheme launching tomorrow, anyone who thinks they might benefit should seek advice and can visit our online calculator and find out more. The cost of a State Pension top up is based on a person’s age and takes average life expectancy into account. For a 65-year-old, an extra £10 of pension a week will cost £8,900, whereas for a 75-year-old the contribution rate for the same amount of pension is £6,740. 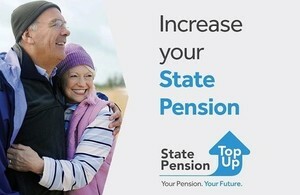 More information on State Pension top up and how to apply is available at www.gov.uk/statepensiontopup. This includes an online calculator which illustrates the contribution rates based on age and the additional amount someone wishes to receive. The benefit helped ensure pensioners were able to stay warm during the coldest spells of last winter, with a one-off payment of between £100 and £300 to help towards the cost of heating their homes. The government’s commitment to protect the elderly by maintaining universal pensioner benefits means that nearly 9 million households were helped by the scheme, with 6.7 million women and 5.7 million men benefiting. In total, more than £2.1 billion was paid out. Winter can be hard for older people, particularly those who are vulnerable, and they should have the confidence to turn up the heating when they need to, safe in the knowledge that they will be able to afford to pay the bill. Winter Fuel Payments give people this peace of mind and remain central to our one nation commitment of a compassionate society which puts economic security at its heart. On top of Winter Fuel Payments, around 2 million households also receive help each year through the Warm Home Discount scheme. This year’s payment is giving more than 1.3 million of the poorest pensioners an extra £140 off their energy bill. The government also provides Cold Weather Payments of £25 a week, giving an additional layer of support for vulnerable people in low-income groups during the very coldest snaps. As well as UK recipients, an additional 140,000 expat pensioners living in the European Economic Area or Switzerland also received a payment, costing a total of £24.5 million. People may qualify for a payment if they live in Switzerland or a European Economic Area (EEA) country and have a genuine link with the UK. This year new rules are being introduced and Winter Fuel Payments will no longer be payable to people in EEA countries which have an average winter temperature that is higher than the warmest region of the UK. This includes people living in Cyprus, France, Gibraltar, Greece, Malta, Portugal or Spain.